"The Adventures of Tom Sawyer" – Tom Sawyer lives with his Aunt Polly and his half-brother Sid. He skips school to swim and is made to whitewash the fence the next day as punishment. Tom falls in love with Becky Thatcher, a new girl in town, but shortly after Becky shuns him, he accompanies Huckleberry Finn to the graveyard at night, where they witness a trio of body snatchers getting into a fight. Tom and Huck run away to an island. 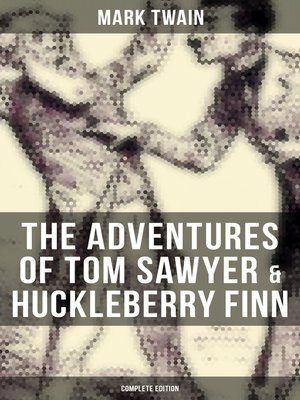 While enjoying their new-found freedom, they become aware that the community is sounding the river for their bodies... "Adventures of Huckleberry Finn" – Huck Finn and his friend Tom Sawyer have each come into a considerable sum of money as a result of their earlier adventures. Huck is placed under the guardianship of the Widow Douglas, who is attempting to "sivilize" him. Finding civilized life confining, his spirits are raised somewhat when Tom helps him to escape one night, but his alcoholic father turns up and kidnaps him... "Tom Sawyer Abroad" – Tom, Huck, and their friend Jim set sail to Africa in a futuristic hot air balloon, where they survive encounters with lions, robbers, and fleas to see some of the world's greatest wonders, including the Pyramids and the Sphinx. "Tom Sawyer, Detective" – Tom attempts to solve a mysterious murder in this burlesque of the immensely popular detective novels of the time. Samuel Langhorne Clemens (1835-1910), better known by his pen name Mark Twain, was an American writer, humorist, entrepreneur, publisher, and lecturer.